Seven variations on "Bei Männern, welche Liebe fühlen"
These two young musicians have won all sorts of awards, ranging from the prize of the Concours Rostropovich for cellist Norbert Anger to the first prize and audience prize of the Steinway Piano Competition for Nicolai Gerassimez. They became acquainted as prize winners of the German Music Competition and discovered their shared love of chamber music. 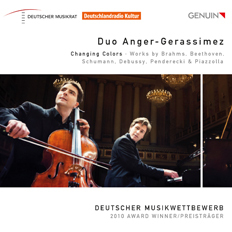 As the Duo Anger-Gerassimez, they show the colorful variety of the combination cello/piano on their debut CD. They succeed superbly in rendering Brahms with pathos, Debussy with a playful quality and Piazzolla erotically. In so doing, the two young talents do not shy away from experimentation, either: in the Grand Tango of Piazzolla, the cello sounds like an electric guitar thanks to a special sound effect. A must for open minds and ears! "This is an outstanding interpretation,...full of feeling and virtuosity."